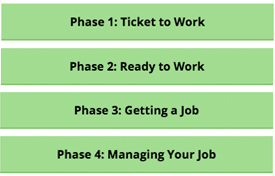 Here are five ways you can learn more right now about Ticket to Work! Watch Ben's journey and learn more about how Social Security's Ticket to Work can help you achieve greater financial independence by providing you access to free employment support services. Then read an overview of the Ticket to Work Program Work Incentives. Whether you are just considering working, ready to find a service provider to help you, are looking for a job, or already working and want to keep on the road to financial independence, explore the Path to Work to learn more at every part of your journey. And, if you prefer to get information via email, you can sign up for our “Journey to Financial Independence” email series that will provide you weekly information you can use to achieve your work goals. 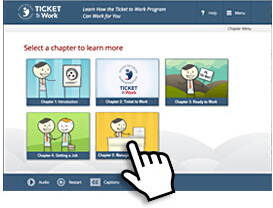 Learn more about the Ticket to Work program through these self-paced Ticket to Work Tutorials. Whether you are just considering working, ready to find a service provider to help you, are looking for a job, or already working and want to keep on the road to financial independence, these four interactive learning modules will equip you with the knowledge you need to achieve your work goals. 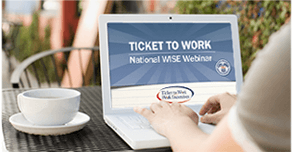 WISE webinars are free, live online events for those interested in learning about Ticket to Work, Work Incentives and other disability employment related topics. Social Security and disability employment experts will be available to answer your questions. WISE webinars are hosted on the fourth Wednesday of each month. Register online or call 1-866-968-7842 or 1-866-833-2967 (TTY).  Do you have questions about Ticket to Work or are ready to get started? Our Ticket to Work Help Line is staffed with knowledgeable and friendly people who can answer your questions about the program, get you enrolled and connect you with free employment services. Experts are available Monday – Friday, 8 a.m. – 8 p.m. ET. Call 1-866-833-2967 or 1-866-833-2967 (TTY). Experts are available Monday – Friday, 8 a.m. – 8 p.m. ET. Call 1-866-968-7842 or 1-866-833-2967 (TTY).